Back up the mountain again and this time taking on a big one. 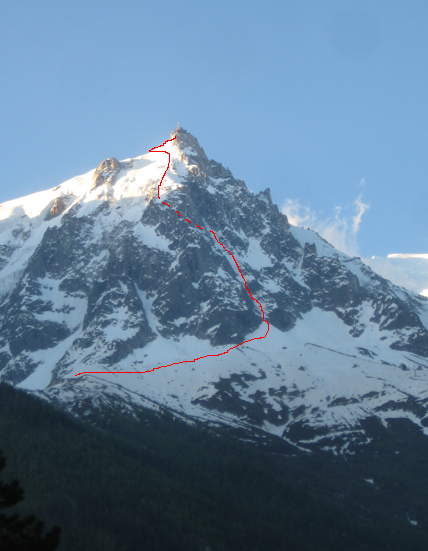 My initial plan was to do the Midi-Plan traverse with my housemate then we heard there was a lot of snow on it and you have to be early and quick, then plans changed to the Tour Ronde north face with Tom Grant and a friend of his. After discovering that the Panoramic to Helbronner does not run until 9:30 and that would be too late as the isotherm was around 3800m and it would not have refrozen. I then had a text from Ally saying he and his housemate were going to go up the Eugster from first bin. From mid station to the top is over 1500m hight gain and the climb itself is just over 1000m. I wasn’t keen to start with because it is a seriously committing climb as there is no where to go unless you down climb from where ever you are. 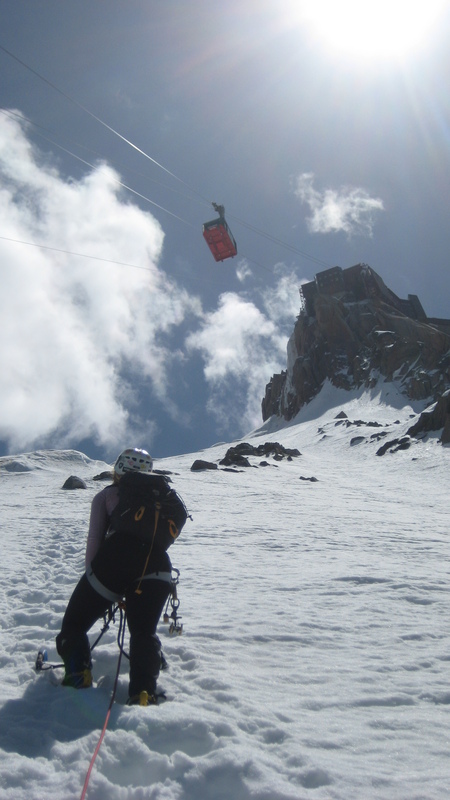 That said, it is a ski line in the spring so I knew it wouldn’t be difficult climbing, if you had good conditions. 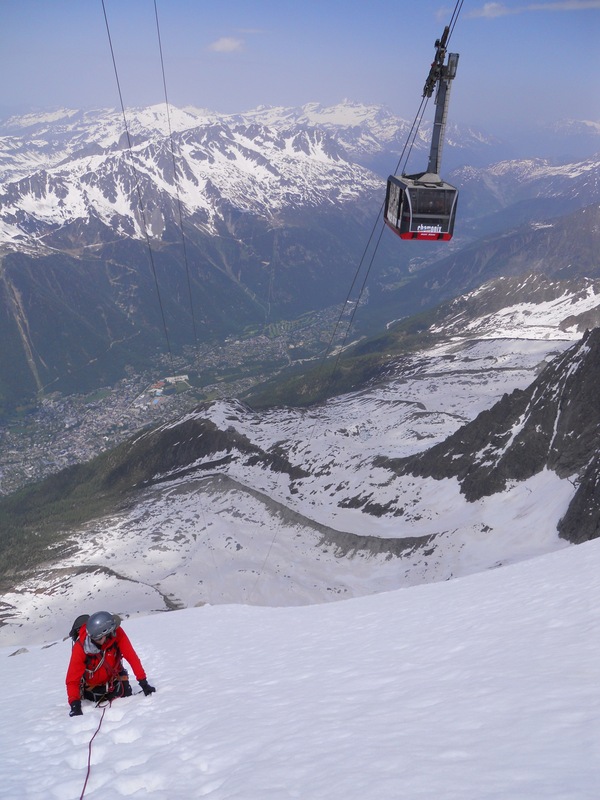 We got first bin to the Plan D’Aiguille and then headed off on our approach, the guidebook says it takes 1.5 hours and it was spot on, we did have to negotiate some moraines but we were at the start of the route just after 9:30. First bin didn’t leave until 7:45 delayed from it summertime of 7:10. I teamed up with Emily so we could move in two groups of two as Allys friend Francis had also come along for the climb. 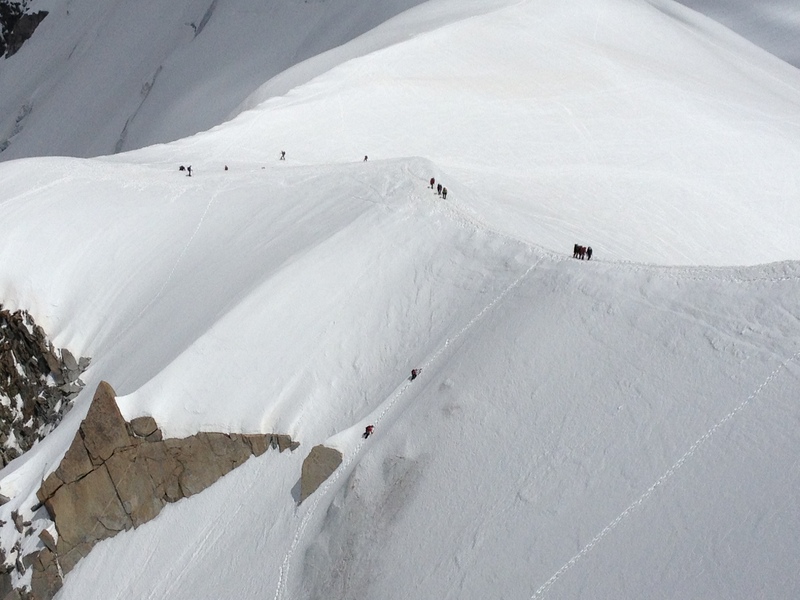 Those boys had already started up the couloir as they got there a little before us. We were questioning whether to climb or not because the snow had not refrozen at the bottom and we thought it might be a long slushy climb as a result. Ally and Francis made quick work of the first section so Emily and I thought we should get on with it also. Straight away we ran into a section of ice about 5-10m high and it had running water beneath it and was very hollow and thin. 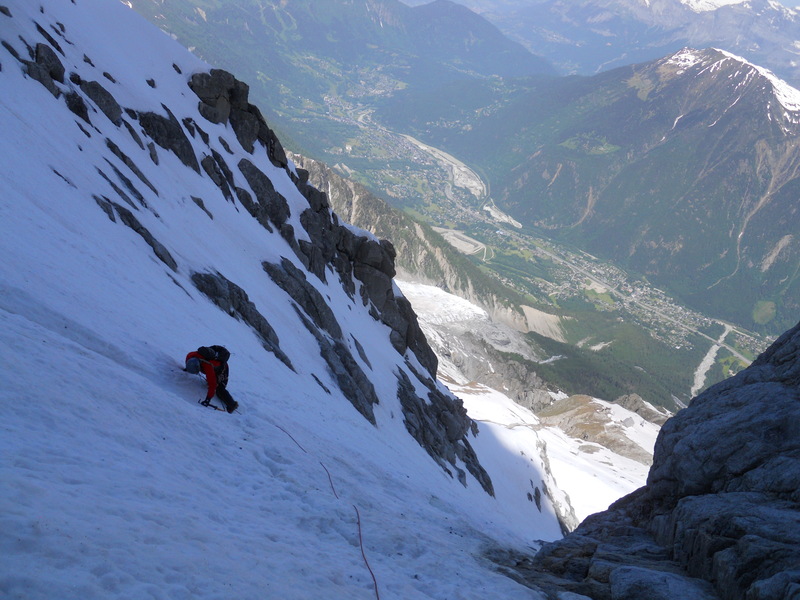 A quick belay over this and then we started storming up the couloir which had nice footsteps in. A few hundred meters of climbing and we hit another ice band, this one was too dangerous to climb so we headed around it via a small rock band, it was nice to put some protection in so you can have a relaxed rest. Moving up the couloir again after in the nice footsteps we came to the start of the Diagonal. 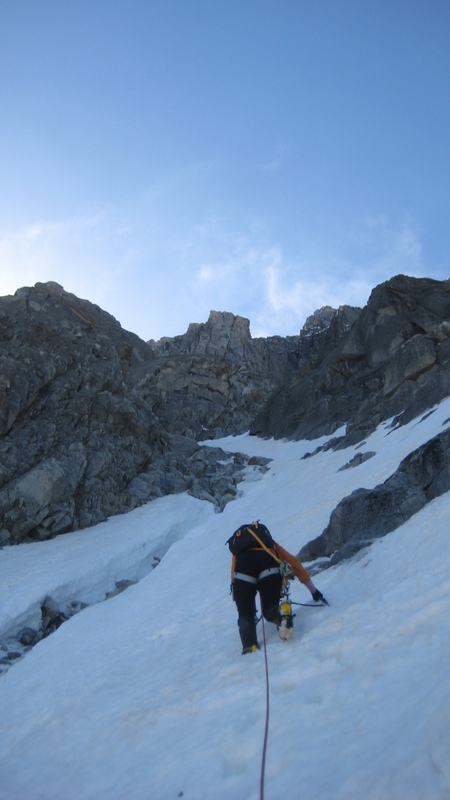 This is usually a rock climbing section of the route in the summer but as there is still so much snow there was only about 10-20m of mixed climbing before we were on the snow slopes of the Diagonal and back onto a traverse to the left bank of the diagonal. Further up the Diagonal we cam into another rock and ice section, this was hard to protect and it was around midday so it was starting to get very warm with lots of water running down it. Moving slowly over this problem we were on the final push out of the diagonal and on to the North Face snow slopes with the Aiguille du Midi station in sight. Seeing the lift only made things harder as you can see your goal and we were feeling pretty tired by this point. We slowly plodded up the north face snow slopes stopping every know and then to catch our breath. 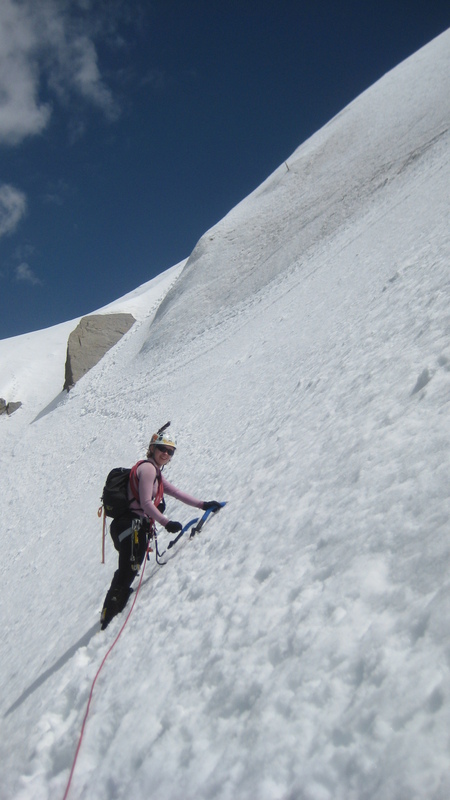 Just below the top station there are a couple of big crevasses to work around to reach the arete. We chose the path that traverses between the two. This took us nearly one hour as the snow was very soft and we didn’t want to make a mistake so near to the top of the climb. Ally snapped a few photos from the viewing platform as he arrived over two hours before us. 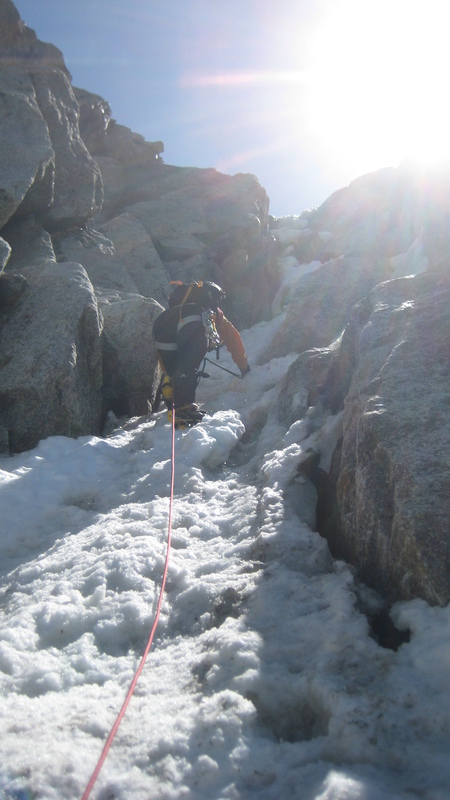 Here we are just crossing the first crevasse. 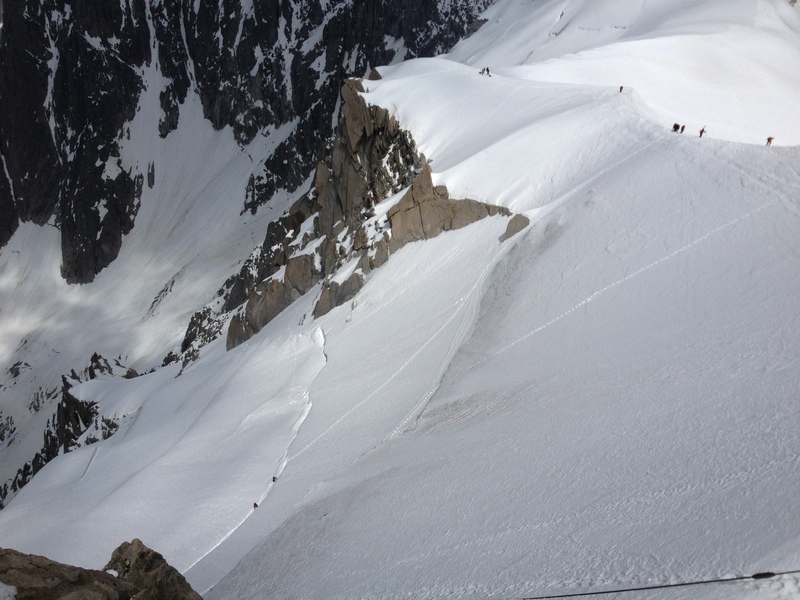 We carried on the traverse and over the second snow bridge and then up the final few steps to the arete, I was physically and mentally destroyed. Arriving just after 3pm it had taken us 5.5 hours for the climb and a total of 7 hours for the ascent. I was pleased with this time as I didn’t know if I had the fitness to get up the thing in the first place. It was so nice to sit on the viewing platform in the hot sun and eat my pastries that I carried the whole way up. Getting back to town a hour later and the heat was unbearable, 33’c on some thermometers, No wonder the snow was soft. I think I will be avoiding the Midi North Face for a while but I might go back to take on the Frendo spur sometime in the next couple of months. Thanks to Emily for the climb and Ally for the photos.